A penny saved, is a penny earned. Well, Benjamin Franklin’s famous face has made it all the way to the $100 bill, which means having an entire stack of Benjamins is always a healthy thing to have in your bank account or wallet, that is for sure. 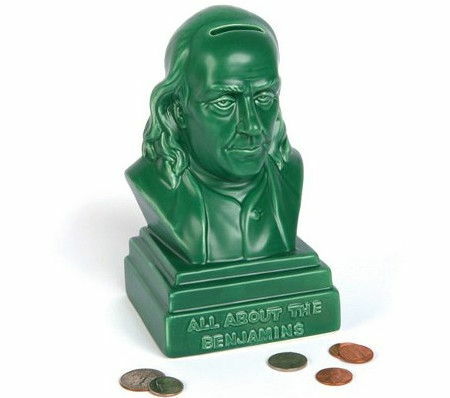 Having said that, the $21.99 Benjamin Franklin Bust Bank would be a constant, nagging reminder that you ought to keep on saving money – if you would like to see all those collected coins end up being exchanged with an entire note. This particular bust would look great on every and shelf, counter, desk, and pile of money, and it is made out of ceramic.